DEARBORN, Mich., April 18, 2018 - Fifty years ago, the Ford Mustang Cobra Jet took to the staging lanes at drag strips everywhere - and along with the resulting wins, a legend was born. Now comes the return of the Mustang Cobra Jet drag strip race car by Ford Performance - is targeted to be the most powerful and quickest version from the factory yet, capable of running the quarter-mile in the mid-8-second range while topping 150 mph. 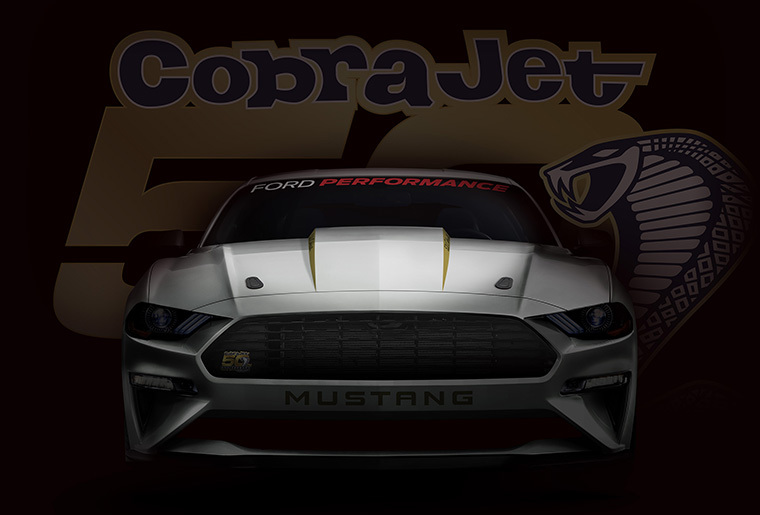 "From the very first Mustang Cobra Jets dominating the 1968 NHRA Winternationals to our modern-day Cobra Jet racers, the Ford Performance Parts team continues to build the Cobra Jet brand based on its success at the track over five decades," said Eric Cin, global director, Ford Performance Parts. "That, in turn, has inspired generations of Mustang fans to create their own performance machines for the street." Final 2018 Mustang Cobra Jet ordering and product specifications will be released this summer. The car is designed to be legal for National Hot Rod Association drag racing, along with several National Mustang Racers and National Muscle Car Association classes.